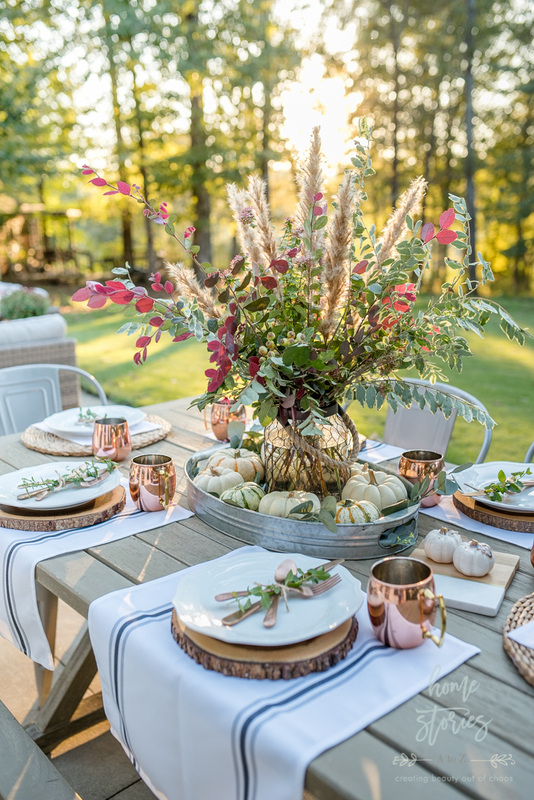 Get ready for guests this fall with affordable fall decor and entertaining pieces that don’t cost an arm and a leg! Implement these budget-friendly decor tips to create stylish and beautiful spaces that set the stage for memory making. This post is sponsored by Walmart.com. All opinions on the cute and affordable products are my own! Post contains affiliate links for your convenience and to help support my blog. Thanks for purchasing items that catch your eye through my links! 98% of what you see in the pictures was purchased at WalMart.com or at Walmart in store! All of the details and source links for products can be found below in my post. Let me know in the comments if you’re having trouble finding an item, and I’ll do my best to help if I can! 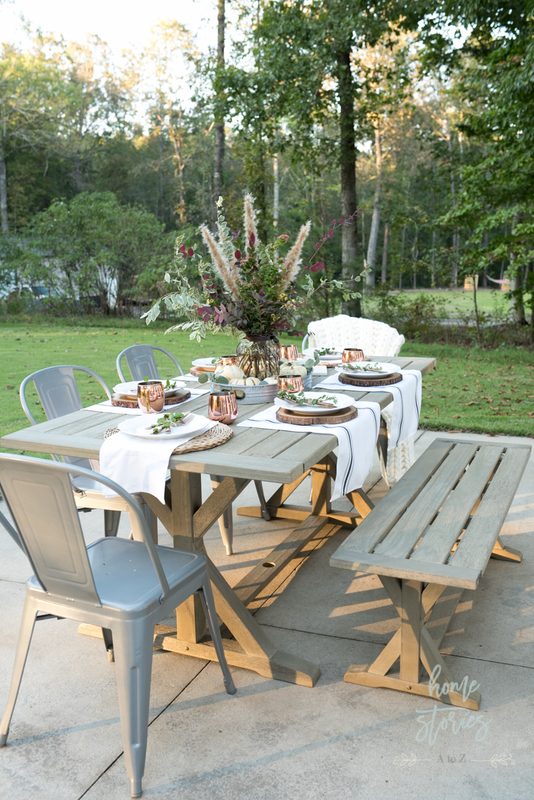 The heat and humidity in the south is finally giving way to cooler fall temps perfect for outdoor entertaining! 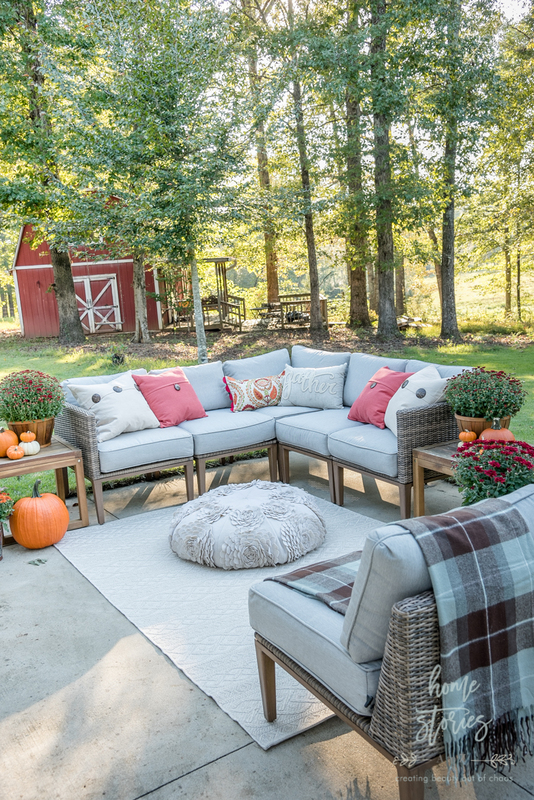 Today I’m sharing tips on how to create an affordable outdoor oasis for family and friends this fall. 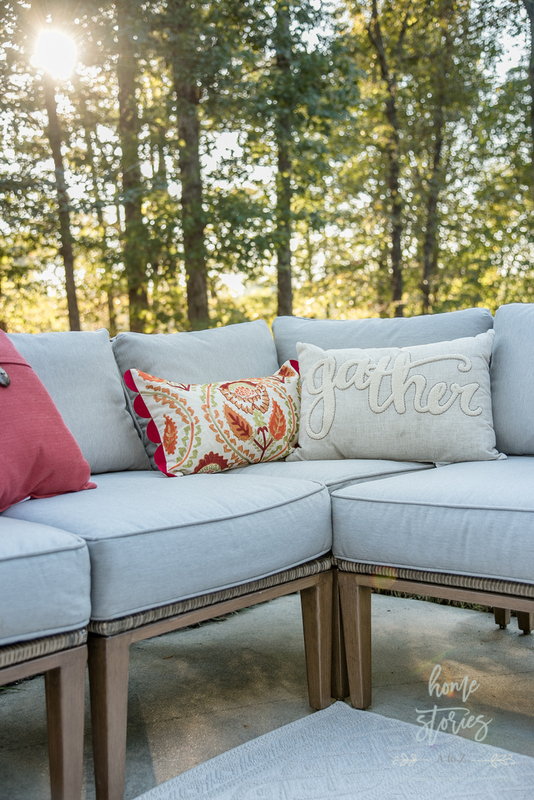 Don’t fret if your fall weather isn’t quite as conducive to entertaining al fresco. 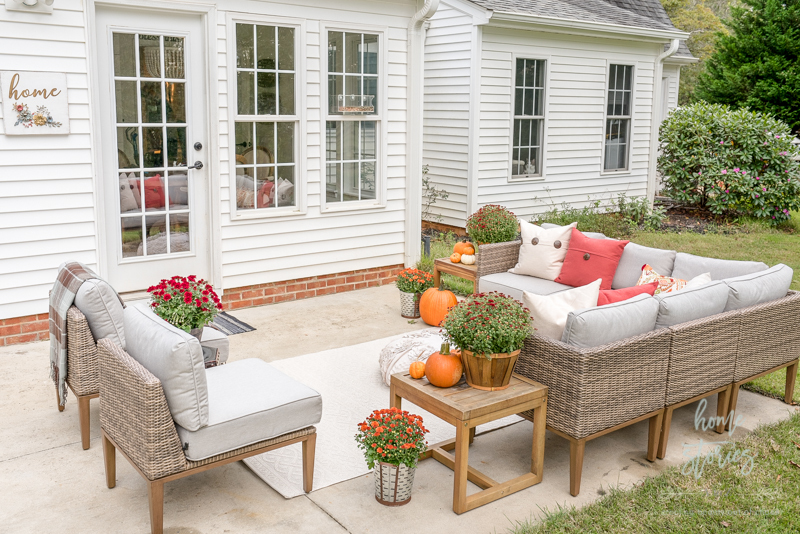 Many of these tips translate to indoor fall decorating and entertaining as well. 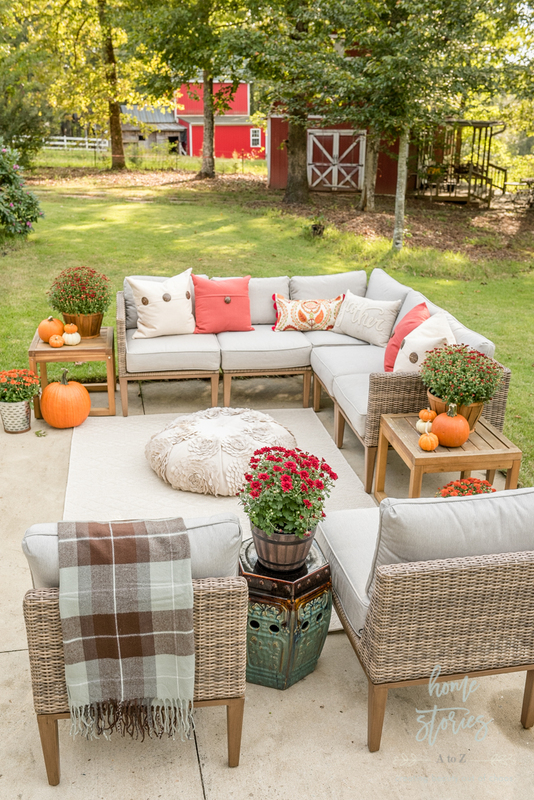 Fall Decorating Tip 1: Layer on the cozy textiles! 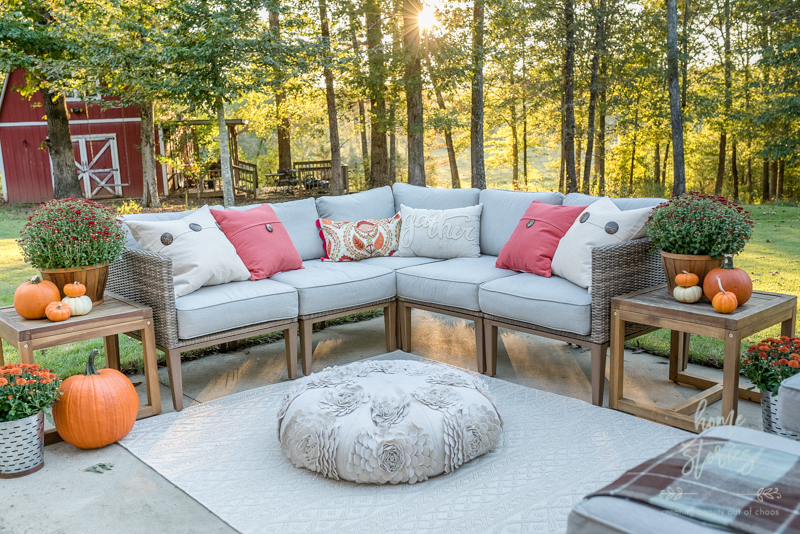 I approach decorating our outdoor seating area the same way I approach our indoor family room. I want guests to feel at home, comfortable, and cozy! For me that means lots of toss pillows, throws, poufs, and a comfy rug. Walmart.com offers a fabulous selection of stylish, affordable, and durable textiles that allow me to change my look frequently. If you’re a regular reader of mine, then you know I buy most of my Walmart items on Walmart.com, and I shop by style which allows me to find exactly what I’m looking for quickly and easily. I’m able to add items right to my cart then and there and checkout in a flash! Walmart.com also offers free shipping on orders over $35 with no membership fees required. Many of the items come with 2 day shipping which I love! If you don’t love shopping in-store, I highly recommend giving Walmart.com a try. I think you’ll be pleasantly surprised at what you find! Speaking of frugal finds, you can shop all of the sources for our patio below. Simply click on the arrows to scroll through the items and click on the pictures to shop the products that interest you! You might notice that the pillows I chose are not made for the outdoors. I don’t mind bringing in all of our cushions when not in use, so I don’t worry too much about using exclusively outdoor toss pillows on the sectional. I do however highly recommend using an indoor/outdoor rug that can withstand the elements and this one is amazing! It has a gorgeous cable knit pattern that is perfect for fall and it cleans up nicely. Our patio receives full sun during the day so any moisture on the rug dries out. If your patio is shaded and exposed to the elements, it’s best to roll up the rug and store when not in use. Fall Decorating Tip 2: Find an inspirational object to guide your design and color palette. As a neutral lover at heart, I don’t typically use traditional fall colors for fall; however, this gorgeous Rizzy Home Floral Pillow caught my eye and dictated the rest of my design. Designing a space flows more smoothly when you are inspired by a piece from which you can grab colors and textures for the rest of your design. I often find inspiration in a throw blanket, piece of artwork, pillow, vase, rug, or other decorative accessory. The rust oranges, reds, and pale greens in the pillow set the stage for my design, making my other decor decisions easy to make! You can find the cute Gather Toss Pillow here. It’s so adorable for fall and is priced at less than $12! 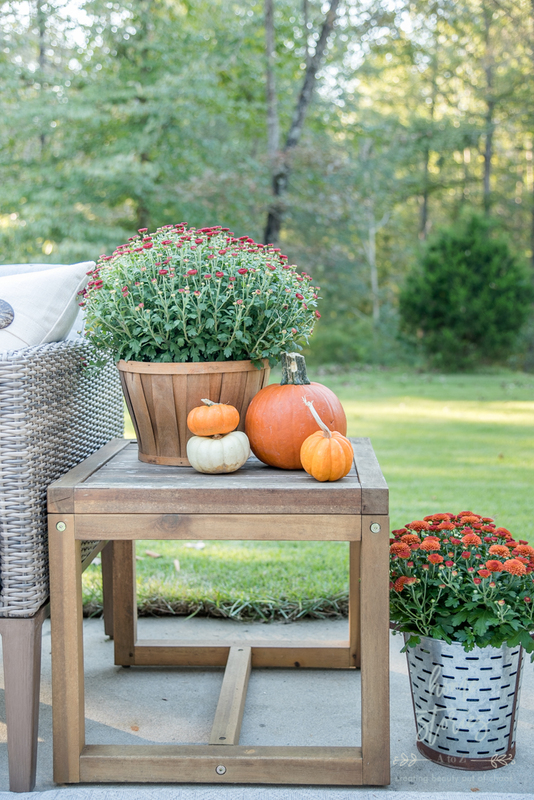 Fall Decorating Tip 3: Bring natural and organic elements into your decor. Natural elements in your decor both calm and enliven a space simultaneously! 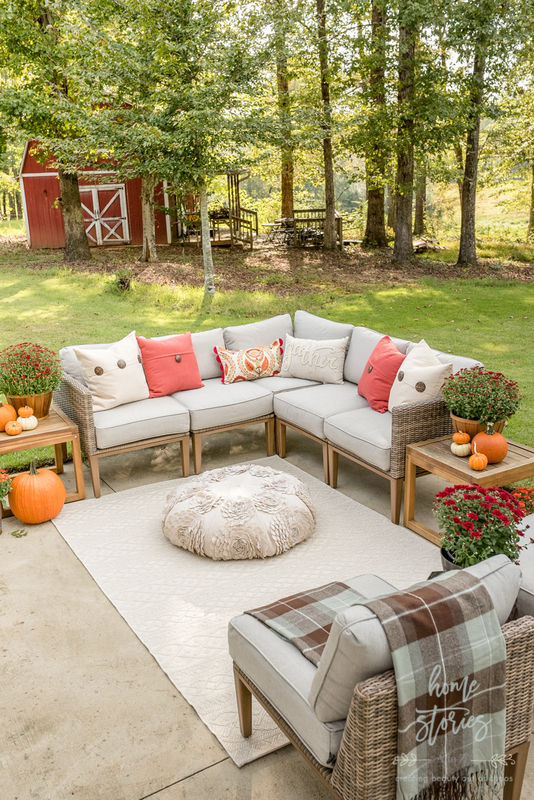 Seasonal elements such as pumpkins, mums, pinecones, leaf branches, seed pods, and other fall elements are all affordable accessories that bring cozy charm to your outdoor room. All of my pumpkins, mini gourds, and mums pictured below were purchased in store at Walmart. For a more polished look, use decorative baskets or buckets to display mums. I found the cute galvanized olive buckets in the seasonal section at Walmart. 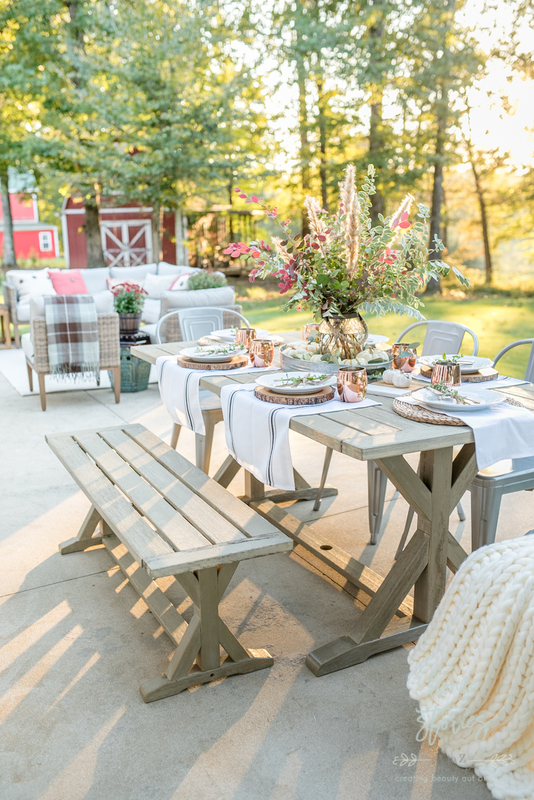 Fall Decorating Tip 4: Create an outdoor table fit for indoors! 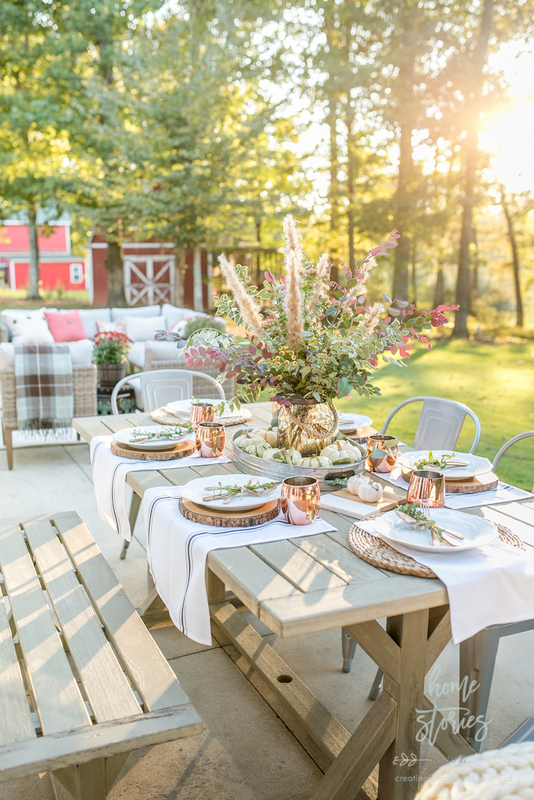 Dining outdoors doesn’t have to always mean paper plates and melamine. 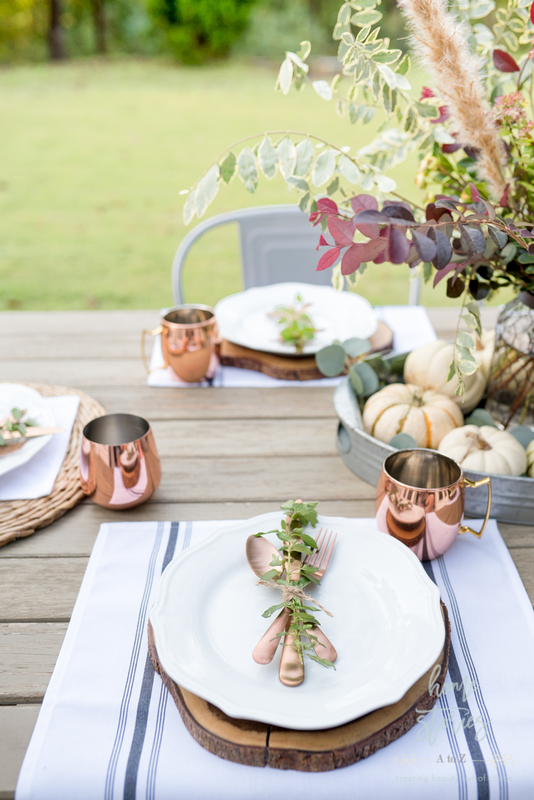 Don’t be afraid to elevate your evening by using indoor dishware outside. Our kitchen isn’t that far from our patio, making it easy to carry dishware to the table. I love these everyday Better Homes & Gardens Scalloped Dinner Plates! They look beautiful on both casual and fancy tablescapes and if one accidentally breaks they are affordable enough to replace. 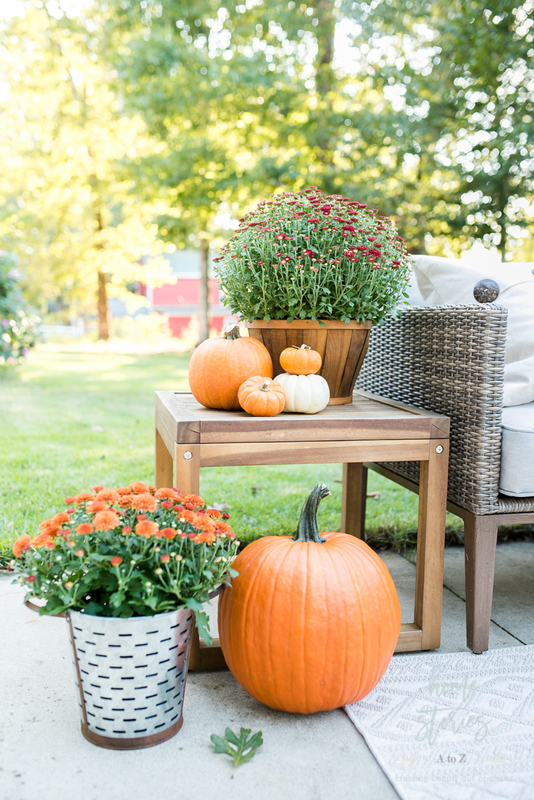 Fall Decorating Tip 5: Create a free showstopper centerpiece using clippings from your yard! For my centerpiece, I originally had a few larger pumpkins corralled in the center of the galvanized tray surrounded by the smaller gourds. It was pretty but honestly kind of boring. I’ve used this Better Homes & Gardens Nautical Lantern as a vase in the past and love the way it looks! After a walk around our property–with a pair of garden shears in hand–I whipped up this beauty. And the best part is that it didn’t cost me a thing! When I lived in the city, I still found creative ways to implement this trick! If you don’t have property of your own to roam and forage, take a hike in the woods, look around your neighborhood, and ask friends if you can clip a few branches from their stash. 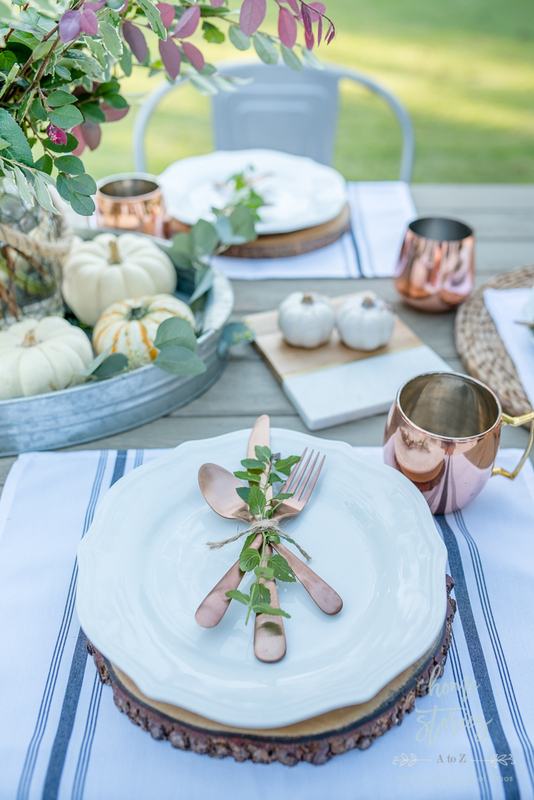 Fall Decorating Tip 6: Find simple and creative ways to make the place setting special! Namecards, mini pumpkins, a flower, a piece of fruit, a small gift, or even just a carefully placed napkin welcome guests to your table and set the tone for the evening. I used a piece of twine and fresh mint from my garden at each place setting. It cost me nothing and adds interest to the table! Click on the links (any words in blue are links) to be taken to the products. Thanks so much for stopping by today! I love sharing affordable and creative decorating ideas with you and hope you enjoyed my tips! You can see more of my daily behind the scenes on how I create these spaces by following me on Instagram. I’d love to connect with you over there! 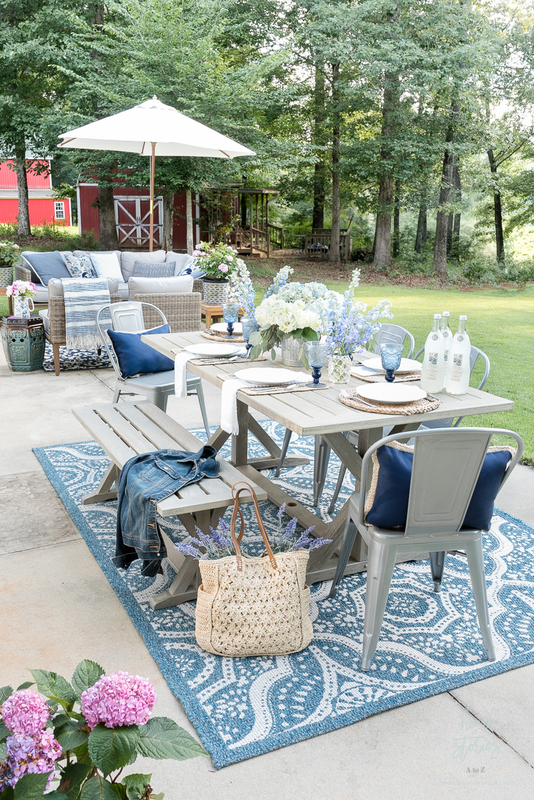 You might also like my related spring patio post: My Affordable Patio Furniture and Outdoor Decorating Tips! Look great! It’s so unfortunate that here in the UK is way too cold to enjoy our patio in the Autumn. Gorgeous! I love every last detail!! 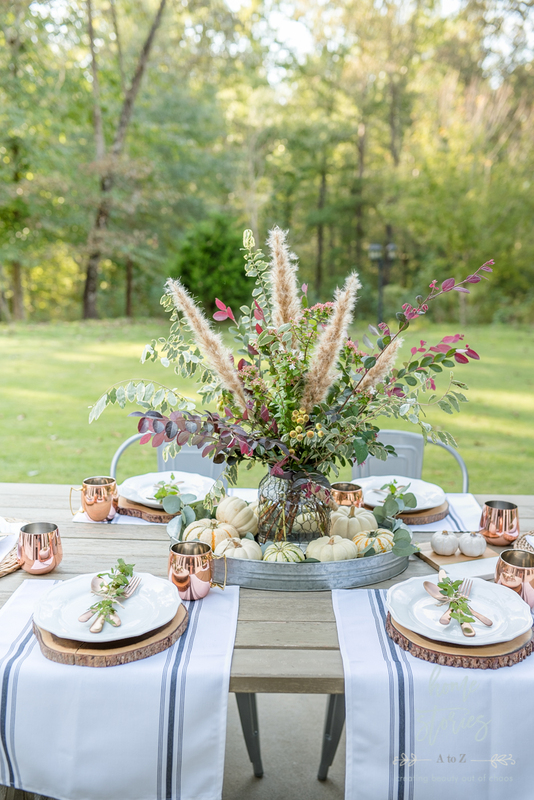 beth your fall patio and outdoor tablescape is just lovely. i hope with the fall weather finally here you and your family will get to enjoy it lots.